I attended a baby shower for a friend here and was pleased to see lots of De La Vega art on the walls. (http://en.wikipedia.org/wiki/James_De_La_Vega) Aside from that and particularly efficient waitstaff, this restaurant is not what you’d expect of a Madison Ave address. The luncheon included salad (very basic no frills), a beverage ( I had a 1/2 ice tea, 1/2 lemonade- yum! 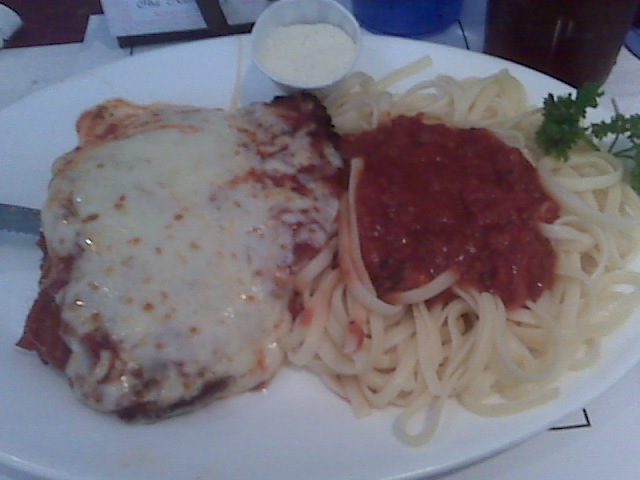 ), and a choice of a 3 entrees: Fish & Chips, Chicken Parmesan with linguine or Salmon with a baked potato. I was actually surprised by the chicken parm….but I kind of wrote it off to: 1) being really hungry and 2) the fact that if you bread & deep fry anything, and then melt some mozzarella on top, it’s pretty hard to make it taste bad. That said, credit where credit it is due. The chicken was crispy- not at all soggy, and the cheese was broiled the perfect amount. The pasta, however, was unremarkable. The grated Parmesan that came with it in a plastic cup? Well, I’m pretty sure it came out of a green can.